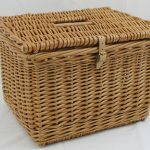 We mostly custom make hampers to order and to specific sizes. 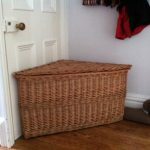 Either to fit in a limited space or to accommodate specific items. 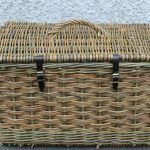 There’s a choice of willow colours but we would recommend having buff for the main structure of the basket, especially if the basket is going to work hard. 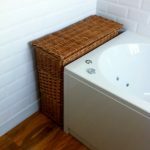 Buff is the strongest of the four colours and therefore gives strength, rigidity and durability to the basket against the knocks it’s likely to have to endure. 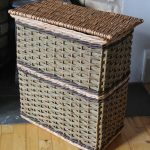 Green or Steamed willow can be used to add bands of colour or for the entire weave area. 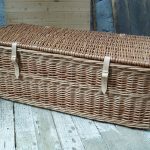 Please contact Alison by email or by phone on 01294 829012 to obtain a quotation for your basket. 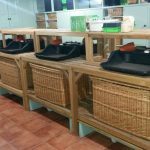 We aim to provide long-lasting, good-looking baskets to the size you need, at an affordable price. 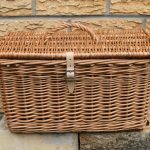 We don’t charge any extra for bespoke baskets. 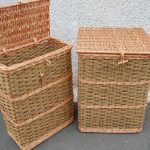 We make hampers for use in the Theatre – with escape hatches at the back, false bottoms and lids strong enough for a man to stand on. 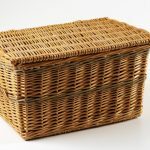 It’s fun working with theatre production on the more unusual baskets and often to tight deadlines. 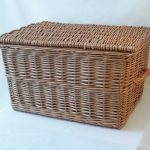 Probably the most memorable baskets we made were for a Shakespeare production. 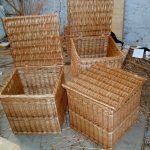 They required two half-made baskets: one well made and one badly made. 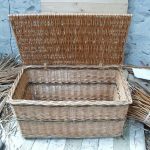 The well-made one was easy enough, but trying to make a badly-made basket proved trickier, as the basketmakers hands naturally wanted to correct the mistakes. 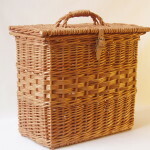 We should have got a non-basketmaker (i.e. me) to make that one; making it badly would then have been very easy indeed. 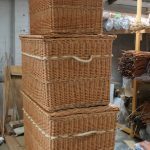 The stack of three hampers above, with rope handles, were for a theatre production and had to be strong enough for a man to stand on.